DNA vs. The Book of Mormon (henceforth DNABM) offers a sustained argument focused, as the title suggests, on the implications of DNA research for the historicity of the Book of Mormon (henceforth BM). The BM and essentially the universal teaching of the LDS Church state that American Indians (henceforth Amerinds) descend from Israelites, but DNA research tells a completely different story--the evidence strongly supports the theory that Amerinds descend from the inhabitants of the northern part of Eastern Asia (Mongolia and Siberia) while universally disconfirming claims to Hebrew origins. If I were LDS, this is the video I'd want to see. I'm not told what to think and no one is sneering at my faith. Instead, scientists, many of whom are either past or present LDS members, are discussing the science they know and its implications for their faith. Virtually the entire video is comprised of these scholars presenting what they know and how some of them as Mormons have had to grapple with that information. So who are these scientists, what are they claiming science teaches and what are the implications for Mormonism? Those are the questions I'll address, in order, in the next three sections of this review. It is an informal fallacy of reasoning to reject what someone says on account of who they are. If Saddam Hussein taught that 10 x 2 = 20, it wouldn't become false on account of his history of genocide. Still, most of us are more ready to listen to those with whom we have a closer affinity. One is unlikely to welcome parenting advice from strangers, but the respectfully given advice of a close family member may be welcomed. The obnoxious co-worker might tell us with a sneer that our style in clothing is hopelessly out of date, but one's elegant and well-spoken spouse might help us make the transition to the world of 21st century fashion. Likewise, when it comes to matters of faith, we want to hear from those who believe as we do. It's not that no one else has anything worth saying--such an attitude would be foolish. God will do what is necessary when He wants our attention, and sometimes that requires a bit of force. Nevertheless, it's nicer to get a tap on the shoulder from a fellow traveler than a two by four from a seeming foe. That's what DNABM provides, and we are well-advised to pay close attention to this tap on the shoulder. The tone is mild and objective, the speakers are or were in your (if you are LDS) shoes, and the evidence that persuaded them is presented for your consideration. Let's take a brief look at it. 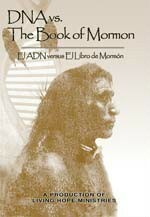 The majority of the BM relates the history of the descendants of Lehi in the New World. According to Church teaching and the BM, to escape persecution in Israel, Lehi and his family set sail, winding up in what is now called Central America around 600 B.C. Two of his sons, Nephi and Laman, became the fathers of huge nations, spreading throughout the Americas, until approximately 400 A.D. The Nephites were the godlier peoples, while the Lamanites were generally wicked and cursed by God, according to LDS teaching, by their being given darker skin (2 Nephi 5:21ff; Alma 3:6ff). The two tribes were often at war with each other, until around 400 A.D., when the more numerous Lamanites slew all the Nephites at a great battle in upstate New York, at Cumorah (according to traditional accounts). The one Nephite survivor, Moroni, completed and deposited the BM on gold plates which were buried in a hill in Cumorah, later found and translated by Joseph Smith. As one would expect from the foregoing, Mormons have long been taught that Native Americans are the descendants of the Lamanites. This teaching can be found on the Introduction page of the BM, and even current LDS President Gordon Hinckley has repeated this claim when dedicating new temples in Central America. It may not be "dogma," but it has been taught, regularly, by the highest LDS authorities and never been contradicted. Further, it's the obvious implication of the BM, given its descriptions of the huge Lamanite and Nephite populations. Between the BM's history, the Lamanites' curse of dark skin and the universal teaching of LDS authorities, the obvious conclusion is that Amerinds are of Lamanite and thus Hebrew ancestry. Enter DNA. A person's DNA is inherited from one's parents, and while some bits of one's DNA are mixed, there are other parts whose origins can be clearly traced back to one parent or another. In particular, the Y-chromosome, which is unique to males, is extremely stable and only passed along, obviously enough, from fathers to sons. It is by testing Y-chromosome evidence that one can determine that Mr. B is Mr. A's father, that Mr. C is Mr. B's father and Mr. A's grandfather, and so on. On the female side, there is mitochondrial DNA (mtDNA). It is only passed along by mothers, though to children of both genders. This enables scientists to trace maternal lineages just as Y-chromosomes allow the detection of paternity. Both tests are extremely reliable, and not just for one or two generations but for many: these testing procedures are an important part of tracing ancestries over many centuries. Given LDS teaching and statements in the BM itself, we'd expect to find confirmatory evidence of Amerinds possessing Hebrew ancestry. Not every Native American nor every Native American people group has been tested, but about 120 Native American populations have been tested, and none has been found to have any evidence of Hebrew or Middle Eastern ancestry. (Nor have tests of skeletal remains offered any evidence of such ancestry.) All pre-1492 (Columbus) DNA samples (referred to as "ancient DNA") have confirmed what has long been believed on the basis of other sciences (archaeology and linguistics, for example); namely, that American Indians are descended from the peoples of Northeast Asia--Siberians and Mongolians. Approximately .6% of tested mtDNA has a non-Northeast Asian origin, but these lineages are traced to post-Columbus migrations from Europe and Africa. In short, there is no evidence supporting the BM and plenty of evidence supporting a different theory, the theory that the ancestors of the Indians came across the Bering Strait to present-day Canada (a trip of about 50 miles) rather than from Israel to Central America (a trip of approximately 8,000 miles). If this is correct, then some fundamental LDS tenets are in trouble. Before we discuss the implications of this research, let's address a few objections first. After all, if the argument isn't any good, there's no need to see what it implies! Objection 1: Why take the word of apostates? Reply: First, not all of the speakers are LDS who renounced the faith. Some are, but at least one is still in the Church, while others were never LDS. Second, those who left the Church did so gradually, precisely because of this evidence. Third, the information they present is specialized, but it's in principle open to anyone to investigate. The scientists are not offering mere testimony, but a report of repeatable scientific research. Objection 2: Maybe the Lamanites were really in just one fairly small part of the New World, so of course it's going to be hard to find genetic ancestry in contemporary populations. Reply: First, scientists have checked in the areas in which Lehi and his descendants were believed to have landed, and there's no indication of Hebrew origins there either. Second, regardless of where they landed and perhaps dwelt the longest, they grew and spread--they didn't just beam themselves miraculously to Cumorah for the great battle there. So there's good reason to think that the Lamanites (and Nephites, for that matter) spread out well beyond their initial realm, but either way, testing has given the Hebrew origins thesis no help at all. Objection 3: Maybe the Lamanites were just one group of many in the New World, so their genes were so dominated by those around them that we'd expect not to see any evidence nowadays. Reply: This seems to be the main reply of LDS apologists. Recall the presentation above of the relevant science: men pass along their Y-chromosomes to their sons, while mtDNA is only traceable through female lineages (beyond a single generation--one can recognize that a boy is the son of his mother, but his children won't have their paternal grandmother's mtDNA). If, however, a Lamanite male has a daughter with a non-Lamanite female or a Lamanite female has a son with a non-Lamanite male, then those lineages will not have any traceable Lamanite ancestry--unless of course any of the descendants remarry into genetically recognizable Lamanite families. Thus if the descendants of Lehi continually intermarried into a much larger population group, it's not inconceivable that their Semitic genetic markers would have disappeared. These are fatal problems for the hypothesis as stated. So let's revise it: there was not massive intermarriage during the times of the BM, but only afterwards. Let's further suppose that there really weren't that many survivors of the Battle of Cumorah. Is this more plausible? Unfortunately, it's not. Between the Nephites and Lamanites, the most conservative guess I can imagine for their total numbers is 500,000 (based on the BM's claim that 200,000 Nephites were slaughtered in that battle [Mormon 6; see also Ether 15, wherein millions of Jaredites (another group of immigrants from the Ancient Near East) were killed]--with more slaughtered in its aftermath--and with the further claim that the Lamanites were far more numerous than Nephites before the final war). As mentioned above, DNA testing hasn't just been done on the living, but also on skeletal remains. Neither in Central America, New York state or anywhere in between has anyone found any trace of Semitic origins during that time period. Second, it would be miraculous for the Lamanites living in 400 A.D. to have genetically disappeared since then. Finally, if they had, this could only occur by their being swallowed up into a larger population group, and this would again put to falsehood the claims of Hinckley and the LDS's regular and univocal statements concerning the ancestry of American Indians. In short, this objection rests on implausible science and on ignoring the history of the Church's teaching, including that of the current president. Between even conservative estimates of their numbers and statements from D&C to the current LDS President, there is every reason to think that the Lamanites and their Semitic heritage should be detectable, and thus the fact that it isn't is a serious problem for the Church. Objection 4: Christians are in the same boat concerning the teaching of evolution. If they want to say that DNA proves Mormonism false, then they have to deal with DNA's proving evolution true. Reply: Such a reply doesn't help LDS truth claims; at best, it shows that Christians are also in trouble. In fact though, Christians aren't in bad shape at all here. There has long been dispute about how best to interpret the book of Genesis, going back long before Darwinian evolution was a gleam in anyone's eye. Some do think the Bible teaches a very young Earth and no macro-evolution (i.e., no evolution across "kinds"--for example, while one can allow the evolution of all present-day dogs from a single ancestral dog, an ancestor that's not a dog is ruled out), especially where human beings are concerned. Others think the Earth is much older, but nevertheless maintain that humans have been specially created. But there are other possible views, too. One might hold that human bodies evolved, but that souls were specially created by God. One might even accept evolution pretty much as scientists say, with or without the intervention of God, and then think that once human beings evolved, God did something special with them (putting them in Eden, etc.). There are other views too, and while some are stronger than others, it's far from clear that any of them is plainly impossible or incompatible with orthodoxy. I will say this, however: if a Christian thinks that DNA evidence is completely irrelevant to human origins but relevant in the case of refuting the BM, it is at least incumbent upon him or her to have a principled scientific basis for differentiating the two cases. Meanwhile, the critic of Christianity needs to show that all the interpretations in question are fatally flawed, and that seems exceptionally unlikely to occur. What does this all mean? Is this just another episode in the history of science and religion, to be met by a shrug of the shoulders while waiting for the LDS hierarchy to work it all out? In some cases, the answer would legitimately be "yes," but not here. If it were an unproven science dealing with a peripheral matter, then sure. The argument of DNABM is neither: it's an extremely well-established science (one the LDS church is extremely adept at using when it comes to its genealogical research!) and a matter of foundational importance--the historicity of the BM and the trustworthiness of Joseph Smith. According to the research, Native Americans are not descended from Hebrews. If so, however, what sense can we make of the history related by the BM? There were no great nations descended from fleeing Israelites: no Lehi, no Laman, no Nephi. The story is false at its very foundations--and that means that Smith was either untruthful in claiming to have this revelation, or else something worse: the supposed revelation had a demonic origin. (Thus the scriptural warning to beware, as the devil can appear an "angel of light" (2 Corinthians 11:14).) Either way, it's not good news: the BM is not historical and Joseph Smith is not a prophet. Thankfully, there is good news! The Bible, whose history, when testable, has always been confirmed, tells us how to meet the real Jesus and how to become God's adopted children. We are saved by God's grace, through faith, not of works (Eph. 2:8-9)--works are the fruit of a life redeemed by God, not a precondition of redemption. Our faith is God's gift (Eph. 2:8) and rests upon belief in and confession of Jesus as the Resurrected Lord (Romans 10:9-10). It is my prayer that my LDS readers (and any other non-Christians reading this, for that matter) will put their trust in the real Jesus, the Jesus revealed in the Bible. A similar invitation is made at the conclusion of DNABM, a video whose message has to be seriously weighed by any Mormon who, if faced with a conflict between God and the LDS Church, would want to follow the Lord. I admit that I do not know the pain such a decision would make, but God has promised that nothing will separate His children from His love (Romans 8). Please prayerfully watch the video. For more information on DNABM, including how to order a copy or watch it online, see Living Hope Ministries.